The story behind this post starts off with this beautiful painting by Laura Dro. Laura is a very talented artist with such a defined color aesthetic. You need to see her paintings and prints, they will brighten up your life. This painting in particular inspired this colorful outfit. I'm assuming those are peonies and well with them everywhere I turn I knew I just had to post it. You all know I love color and mixing such strong tones is not for everyone, but I think this summery outfit is so cute and wearable. The shorts! Tucker is one of my favorite blouse brands. They just have the best prints. I just can't get over this one- paired with hot pink! Wao! And then add these cute sandals in the most amazing blue and you have a winner. Let's talk about this Samudra Clutch. They have a fab selection of beachy images in the best colors. And they pretty much go with everything. My mom has a similar one (which I gave her for Mother's day) and she adores it! So chic and summery. About the accessories. Who doesn't love Loren Hope's amazing designs? They add the right amount of sparkle. And the company that makes these cute studs is having a super sale right now. You can go check out their store here. I haven't told you...I'm in New York....by myself! My family catches up with me on Friday. A little mini break of sleeping in, tons of walking, yummy dining, and window shopping are a welcome cure for the soul even if there is no ailment. I have met with old friends and have met some online friends, Alison and Sue which I have been admiring from afar. And can I tell you, they are as amazing and as sweet as I imagined them to be. I love turning an online friendship into a real life one. So, obviously, bright and bold colors are inspiring me. What is inspiring you lately? Those shorts are inspiring me for sure! Those Tucker shorts are amazing!! Love these bold colors and accessories. Those shorts are so cute. And I love the painting too! we're only a few miles apart right now - ENJOY NYC love - even tho it's gonna be raining the next few days *boo* -- and LOVE that clutch! Loves me some bold colors as well, so of course I'm smitten. Glad you're in my old college stomping ground of NYC , and meeting with new friends to boot. Have a blast lady. These vibrant colours have certainly brightenened my day! A short break in New York - sounds like lots of fun. You're in NY! Enjoooooooy it :) loving all these colors those LR flats are so pretty. Loving the bright colors! The shorts are amazing (I think I need them!). Enjoy NYC- it's such fun! OK that's it I need a Samudra clutch! I'm so happy you're in NYC and meeting up with such fab ladies! Can't wait to hear about it! I need that Samudra clutch too! And the sandals! Hope you have a fabulous NYC day today! Thank you for introducing Laura, the art is fabulous. Enjoy NYC!!!! Love this colorful painting! And those sandals ...So pretty!!! I am OBSESSED with everything! Such a great outfit combination. I LOVE that painting, gorgeous! Have the best time in NYC!!! Love the bold colors!! The painting should be in my living room! Have a wonderful time in NYC! Bright colors are the best!! 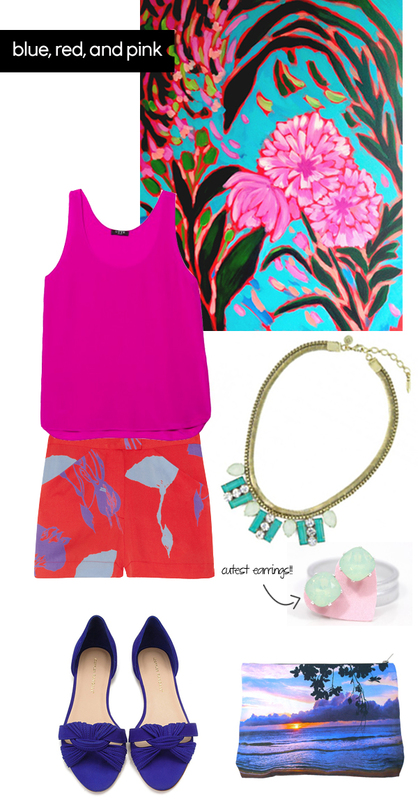 I love the idea of turning art into an outfit, especially when it's filled with bold colors like this one! OK, now I'm obsessed with this art! Great pick! Had the best time hanging with you...come back to NY again this summer...please! Have a great time with your family, enjoy! Thanks so much for the sweet comments on my artwork:) Love all of Albertina's picks!! !